I had yet another snow day this past week. It’s getting to the point where I am starting to feel too relaxed. There is such a thing when you thrive on being on the go go go. However, on this particular snow day, I allowed myself to have a leisurely dinner. I had some Moroccan stew and slowly ate it while reading a magazine I paid a lot for, but never had the chance to actually read. The magazine was called Lucky Peach, and it was their travel edition from Spring 2013. After the first few pages, I was already wondering when my next trip was going to be, and the list of possible destinations was starting to grow at an exponential rate. Then, as part of a story written about an adventure in Hawaii it included a recipe for something called Butter Mochi. I read through the ingredient list, and the recipe itself, and I thought…I can do that. However, instead of Mochiko powder, I used rice flour. I didn’t think there was really a difference. I tried to google it, but I’m still not entirely sure. Some websites say Mochiko is a glutinous form of rice flour, while others say it’s gluten free. 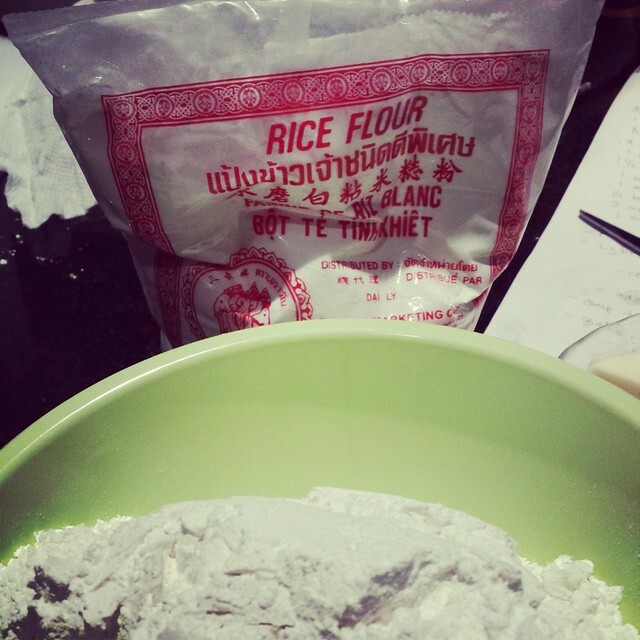 In my haste at the Asian market, I grabbed a bag of rice flour and just used that. I’d be interested to try it again with Mochiko powder to see if there is actually a difference. My guess would be it would be denser, and more like mochi. 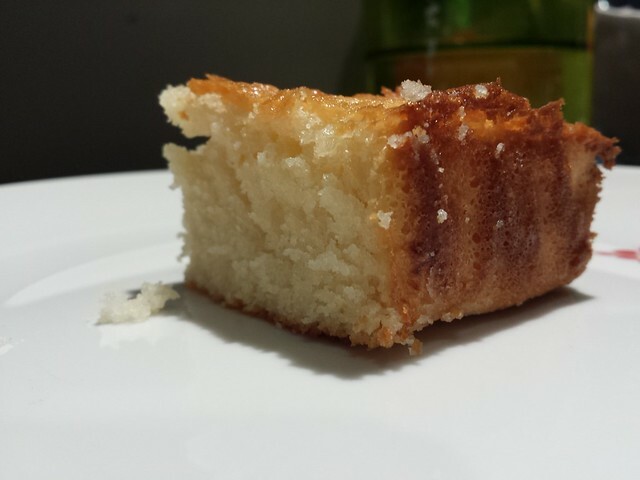 Either way, even with the rice flour, it produced a very delicious, gluten free cake nonetheless. Maybe I will just have to go to Hawaii and try the real thing to see if what I ended up making was even close. Prep a 9×13″ pan. I lined a sheet of parchment paper on the bottom, sling style and took a brush and brushed a little of the melted butter on the paper and along the un-papered sides. In another medium bowl, lightly beat the 4 eggs and vanilla extract. Add in the melted butter and mix. Add in the coconut milk and evaporated milk and give it a good stir to combine. Add the wet to the dry and stir until well combined. 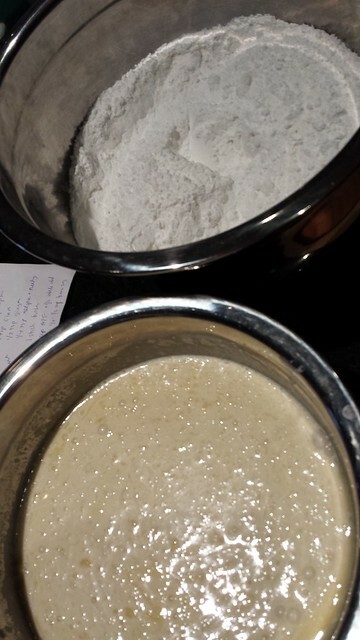 It took me a little bit to realize this, but you don’t have to worry about over mixing since this is rice flour. No gluten! Pour the mixture into the prepped pan and bake for about an hour. Start checking around the 50 minute mark. 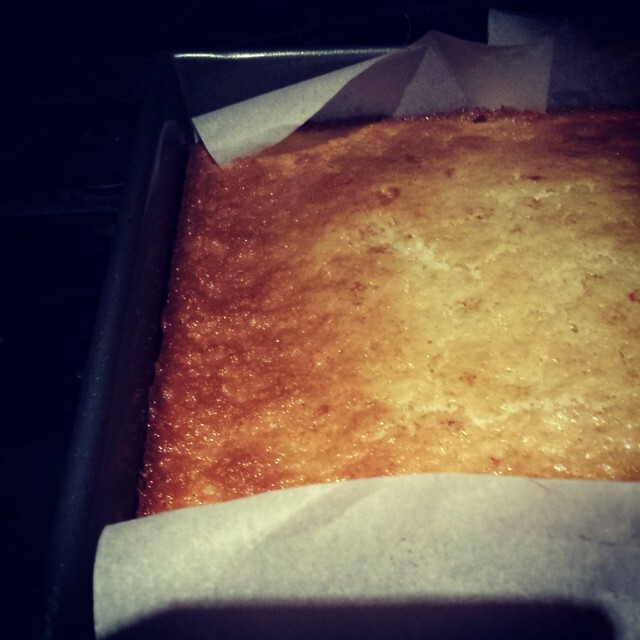 It’s done when the top is golden brown and the edges are browning. Mine was done at the 54 minute mark. Take it out of the oven and let it rest for a bit until digging in. Like brownies, it needs some time to set back up before you can get some clean cuts. Still warm, this was delicious. The cake itself was dense but with a good spring to it. 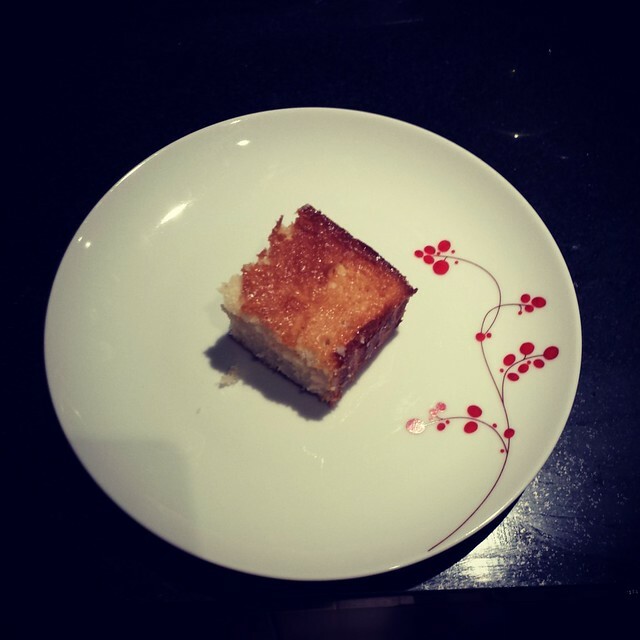 It was moist, slightly eggy and just a hint of coconut. The top and edges were sweet from the caramelized sugars. 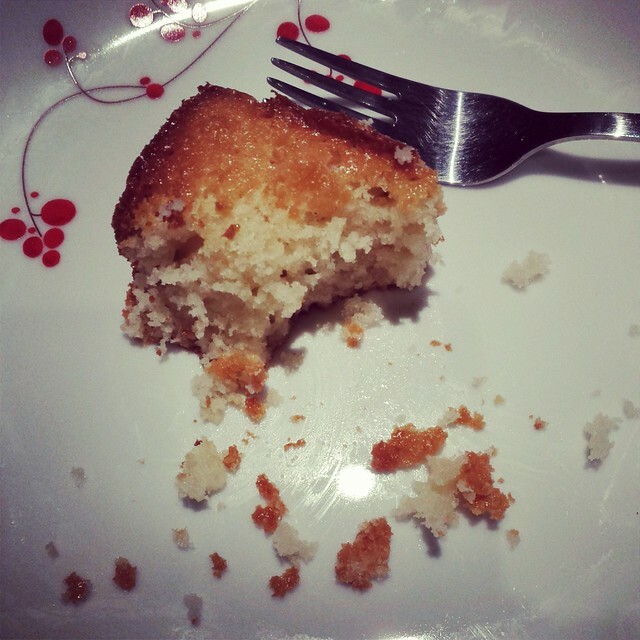 It also smelled deliciously familiar, like the eggy sponge cakes I grew up with. In the magazine they recommend wrapping it in plastic and storing in the fridge. When you want another piece, let it come back to room temp or throw it in the microwave for a short time just to warm it back up. I think I will be doing that….a lot. This entry was posted in Cake, Dessert, snack and tagged butter mochi, Gluten free, Hawaii, Lucky Peach, Moroccan Stew, rice flour. Bookmark the permalink. The world is yours to conquer!! Happy 2014!